Installing photovoltaic solar panels is becoming more and more popular! Take this course and start working on your home, start a career with a solar company or work for yourself. Thousands of home & commercial property owners are looking for independent solar installers to install solar panels on their rooftops. 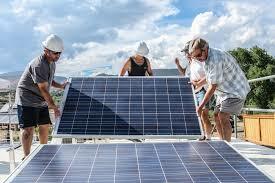 In fact, solar installer positions are fast growing in solar industries. Employment of solar photovoltaic (PV) installers is projected to grow 24 percent from 2014 to 2024, much faster than the average for all occupations. This course will prepare participants to design and install solar PV. Hands-on training through a volunteer organization will be offered free of cost to every participant!